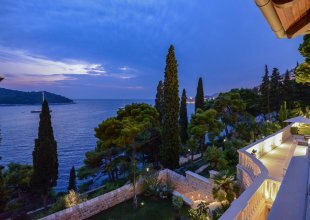 Magnificent luxury Villa Royal Dubrovnik is situated in Dubrovnik, on Lapad Bay - one of the most desirable parts of the Old Town. Dubrovnik is a city of museums and festivals, taverns and restaurants, mild Mediterranean climate and beautiful scenery. Irish writer George Bernard Shaw once said: "Those who seek paradise on earth must come to Dubrovnik". Come to find out for yourself why this is one of the most unique villas in Dubrovnik. A rare super luxury villa, only a few metres from the sea, with its own pool and garden. Four bedrooms, three bathrooms and 1 toilet, exclusive areas, terraces, balconies and spectacular sea views set over three floors. Sleeps 10 people (including extra beds). This exceptional villa is beautifully designed in stone by a team of internationally known architects; its most prominent feature is the lavish use of imported onyx flooring. The villa's rich exterior of stone walls are just the beginning of its true exuberance, which can be explored inside through its luxurious furnishing. Situated only a few steps away from the sea and with spacious surroundings Villa Royal Dubrovnik makes the perfect family retreat or corporate getaway. On the ground floor there is a luxurious living room in which you can indulge all your senses; fully equipped kitchen with dining room and table for dining. A glass wall separates the space for dining and kitchen from the living part what makes every room an individual part. On this floor there is also toilet for the guests. On the first floor there are 2 rooms with double beds with breathtaking sea views and modern equipped separate bathrooms, one with a Jacuzzi. On this floor there is also another room with modern and designer sofa which can be used as a bed. The second floor is home to a beautiful suite with a master bedroom equipped with king size bed, modern en suite bathroom and a big oval glass window with breathtaking sea views. There is also a spacious living room, and terrace with beautiful view. Outside the villa there are few a beautiful terraces with seating to the front of the property overlooking the ocean with BBQ. To the back of the villa, away from the public views there is another spacious terrace with loungers and private pool (30m²) with jacuzzi and geyser option and waterfall.